Taiji fishermen had been out for approximately 45 minutes when they came accross some Risso’s this morning. For going about their daily business and their only misdemeanour, being in the wrong place at the wrong time, they suffered the ultimate penalty. Their lives came to a brutal end in a terrifying finale. Risso’s usually go into deeper waters. Unfortunately they seem to be using the shallow waters at the moment as nurseries. Yes, you get the heartrending picture. Calves were in the pod too. 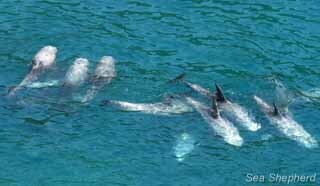 Before I looked into the Taiji hunt, I did not know anything about the Risso’s. The annual Taiji dolpin slaughter is scheduled to begin September 1st. When I think back on the time I spent in Taiji, I don’t dwell on the injustice of my incarceration, but rather on the injustice done to the Risso’s dolphins. In my 20+ years at sea I’ve never seen one up-close. In Taiji I saw them every week and during some terrible weeks, every single day. Terrible, because these were not animals at play in the wild, searching for food or interacting with each other in their complex social structures, but animals scared to death, running for their lives. Running in vain, because no matter how intelligent these dolphins are, they are no match for 12 highly maneuverable diesel-powered boats, driving them with a wall of sound comprised of engine noise and men beating with hammers on steel poles, into a maze of natural, rocky, inlets along the coast until there is nowhere left to go. The nets close behind them. This is the killing cove. Beauty is in the eye of the beholder they say. The Risso’s dolphin is beautiful to me with its melon head and scarred pale bodies. Even without a beak there is a faint hint of the cursed dolphin smile. Besides age, beauty is the selection criteria when the dolphin brokers come in, when the drive has ended and the dolphins are lined up, stranded on the beach; a tarpaulin-covered slave market. Tarpaulin to hide what goes on from the Sea Shepherd volunteers on the cliff. The Cove Guardians, who care deeply about the lives and fates of these animals. We are the last to see these dolphins, before their death or life in captivity as a slave. Although we can’t see the final act, we can hear. When the handlers from the marine mammal concentration camps in Taiji have selected a few souls for a life of slavery, they have thereby condemned the rest of the pod to death and the slaughter starts. We can hear the splashing of the tails in the water and the explosive opening of the blowholes of the panicking animals until it ends. Especially on a windless day, this is a terrifying silence. The sound of no sound can be the most deafening of all. Warning: the above link contains realistic descriptions and an image of dolphin meat. This entry was posted in Dolphin, Taiji Cove and Related Information, Taiji Terror Tales and tagged dolphin, japan, Seaworld, whales. Bookmark the permalink.